After such an exhilarating cross-country road trip into the future, it can be pretty disenchanting to return to a humdrum home. Having experienced the joys of sight-seeing in various smart cities across the nation, it is only natural that you would want to continue living vicariously as Marty McFly. Lucky for you, SECC knows exactly how to transform your living space into a futuristic and energy efficient smart home. Smart grid technology is putting the power in your hands by making energy use more flexible, more dependable, and eco-friendly. New pricing plan options and technology such as mobile apps provide more control for how you consume energy and pay for energy. Coupled with energy efficient lighting and thermostats, to savvy appliances that shift their operation times to off-peak hours to better accommodate the electric grid, smart home gadgets are an additional key to ensuring smarter energy consumption. With the help of our 5 featured smart home gadgets, you can take your home from ordinary to extraordinary while also contributing to a more energy efficient world! Perhaps one of the very first things we do when returning home from a long day’s work is adjust the thermostat so that we can unwind and relax in a comfortable climate. Unfortunately, this routine practice can be detrimental to the efficiency of the electrical grid because millions of homeowners across the nation are engaging in this evening ritual around the same time. During this period of communal unwinding, the electric grid is in overdrive, trying to accommodate for the unyielding surge of energy demand that is occurring throughout the nation. With heating and air conditioning taking up almost half of household energy use, the Nest Smart Learning Thermostat aids in the efficient stabilization of the power demand during peak demand hours by adjusting its operation times to offset the electric influx. With its built in auto-away feature, Nest saves energy by making note of your absence as to not consume unnecessary amounts of energy while you’re away. Since 2011, this nifty thermostat has saved over four billion kWh of energy in millions of homes worldwide! Even more exciting is the compatible phone app that helps to monitor the amount of daily and monthly energy Nest saves. After taking a load off in your temperate abode, it’s now time to prepare dinner for the night. But wait – don’t be so quick to preheat the kitchen oven just yet! Those culinary firehouses demand an astronomical amount of energy, and remember, you’d be just one of the millions of Americans performing the same demanding task. Instead of exacerbating the strain on the electric grid, turn to the energy efficient June Intelligent Oven to bring to life your appetizing creations! Although toaster ovens are typically viewed as the incompetent younger sibling to their much larger counterparts, the June Intelligent Oven’s precise thermal engineering guarantees a quality meal that is sure to satisfy your cravings AND improve your energy efficiency. The advanced carbon fiber heating elements eliminate the need for prolonged preheating, resulting in a considerable amount of energy being saved. Additionally, the overall cooking time is significantly reduced due to the high-volume convection fans that accelerate the cooking process by 25%. Thus, you can enjoy a hearty meal prepared using half the energy, in half the time. Following a nice hearty dinner – courtesy of the June Intelligent Oven – you’re now ready to prop your feet up and recline while watching your favorite evening TV series. However, before reaching for the remote and getting too comfortable, you’ll have to reach for your smartphone to ensure that the WeMo Switch is permitting your TV to be powered on. With its advanced technology, WeMo can be controlled via Wi-Fi to help reduce energy consumption of demanding appliances and electronics. Seeing as your nightly shows don’t premiere until 8:00p.m. – and you’ve been away from home since 7:00a.m. – there’s no need for your TV to be squandering large quantities of energy throughout the day. Unbeknownst to many consumers, appliances and electronics that are physically plugged into electrical outlets continue to consume energy despite their appearing to be powered off. In other words, just because you turn off your TV before heading to work in the morning, doesn’t mean that it won’t continue to use power. Fortunately, with the help of WeMo, you can banish energy vampires and ensure that your home appliances are as energy efficient as possible. Now that the show has ended you’ll have to wait all the way until next week’s season finale to find out the jaw-dropping conclusion. Nonetheless, with the night nearly over, it’s time to turn down the lights and get ready for bed. However, don’t belabor yourself by going from room to room and manually flipping each light switch – after all, you do live in a smart house! Simply use your smartphone to shut off all the lights in your home at once from the comfort of your bed. In the event that your extreme state of evening exhaustion causes you to forget to shut off the lights from your phone, BeOn’s scheduled lighting will automatically turn the lights off for you, as to not have them wastefully consuming energy throughout the night. Equipped with energy efficient LED bulbs, the BeOn system will help to slice your energy bill in half! Perhaps the most impressive feature of this savvy gadget is its ability to store energy for emergency uses. Encounter a power outage during an inopportune time? Don’t fret, BeOn will provide you with five hours of emergency lighting! Wrapping up this list of energy efficient smart home gadgets is a device that is the crème de la crème – an all-in-one home automation hub. In the event that you want to make your smart home even more savvy, Samsung’s SmartThings allows for you to control your thermostat, lighting, and security systems all in one central device. In addition to conserving energy through each attached system, SmartThings will help to conserve your physical energy by preventing you from having to perform each energy efficient task individually. 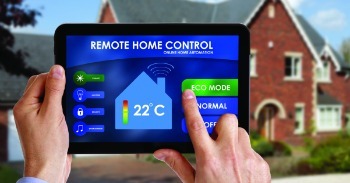 Essentially, SmartThings is where energy efficiency meets convenience. The Smart Energy Consumer Collaborative compiled this list by using information posted on each of the respective product webpages. Although each of these smart gadgets are awesome, there are certainly several alternatives for each product. Want to learn how you can become more energy efficient? Check out our recent article highlighting 3 tips for shifting energy usage.